A new school garden is blooming in North Pole and with assistance from the local Rotary Club, it should grow by leaps and bounds next summer. 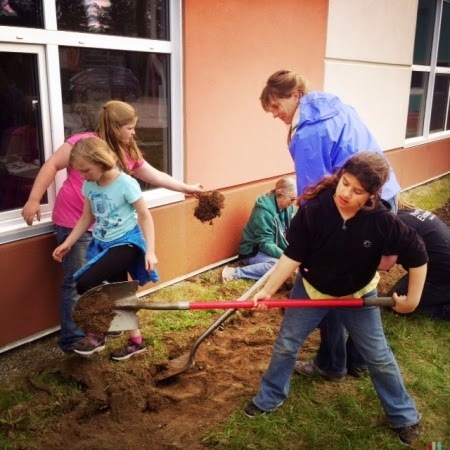 North Pole Elementary School kicked off its gardening activity last spring. At North Pole Elementary School, teachers and students dipped their toes in the waters of growing food last year. “We wanted to give kids a chance at outdoor learning and applied science,” said Principal Mark Winford. Three planter boxes with potatoes, broccoli and other vegetables were a small start for NPES. Now, thanks to a generous donation from North Pole Rotary Club, the school will be able to broaden its agricultural scope. The Rotarians have set aside $11,000 to help the school garden. “It’s farm to table and it starts in the classroom,” Rotarian Michelle Bunch said. “It will be eco-friendly flowers and food. We want to teach children that every food item doesn’t come out of a box.” She envisions a guest chef visiting the school to prepare food that the children grow. “That would be kind of cool,” she said. The club recently invited University of Alaska Fairbanks Professor Pat Holloway to talk about school gardens. Holloway said, “I am absolutely thrilled that you are going to be involved with this school garden.” In her 30-year career at UAF’s School of Natural Resources, Holloway said the programs she has enjoyed the most are the ones involving children. “It’s rewarding to see kids come into a garden with no idea where potatoes come from and to be able to show them how food is grown. Holloway was brimming with suggestions. First, she recommended that some of the beds be raised to be accessible to people in wheelchairs. Then she recommended a book, “Square Foot Gardening With Kids,” which she called a dynamite book. “Kids think in small spaces,” she said. “In a large garden they can get overwhelmed and can’t think beyond their toes.” She advised dividing raised bed gardens into square-foot sections. For peas, Holloway said children can build trellises out of willow branches. “It’s so easy; it’s a piece of cake,” she said. Some favorite varieties are Sugar Ann, Cascadia and Novella. Pumpkins take up a lot of space and need a plastic hoop. Small Sugar, Racer, Rockstar and Lumina were some of the varieties Holloway recommended. She also loves to see flowers mixed with vegetables. If a school is growing edible flowers, Holloway urged that they stick with all edible varieties so children don’t get confused about what they can eat. “It’s one or the other,” she said. Professor Pat Holloway gives a gardening book to Ron Jones, president of North Pole Rotary Club.